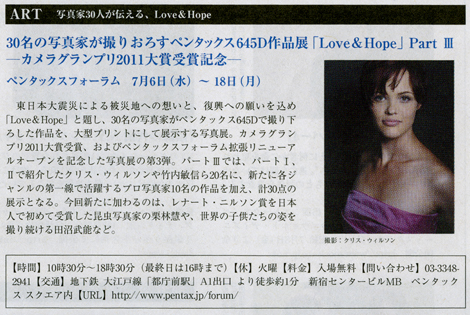 Love & Hope Exhibition discussed in the Tokyo Headline newspaper. I was up in Tokyo last weekend to catch the end of the Love & Hope exhibition at the Pentax Forum, and to photograph the Hamaori-sai festival in Chigasaki. It was good to see the huge print of my image on the wall of the gallery, and then as a bonus find out that Pentax had also chosen it to promote the exhibition in a Tokyo newspaper. Had a good chat with the staff at the forum. They had the special edition Pentax 645D with a traditional laquerware body on sale at a mere 1,200,000 yen. (The perfect thing for the person who loves to collect cameras and then leave them in a hermetically sealed cabinet.) I also got to have a quick play with a preproduction version of the tiny, mirrorless Pentax Q camera. Not sure what I think of the Q. It is the world’s smallest camera with interchangeable lenses, but it will be interesting to see if it can compete with the likes of the Sony NEX-C3, the Olympus PEN or the current belle of the miniature ball the Fuji X100. Hopefully I will have a solo exhibition of my festival images at the Pentax gallery sometime in the next couple of years. 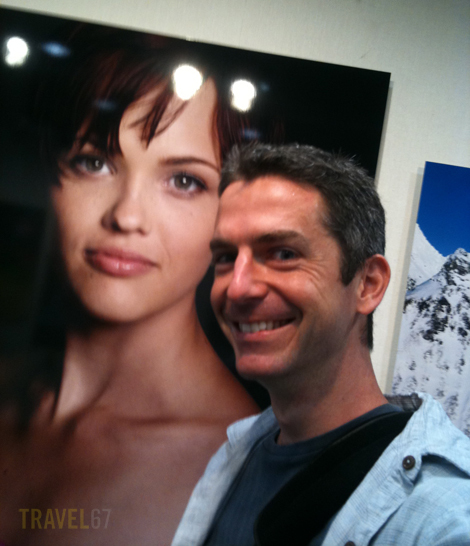 With that in mind, it was time to meet up with a couple of photographer friends and head out of the city to Chigasaki. The X100 is not nearly as small as the Q (at less than half the weight of the X100), and the former has a fixed lens, and a bigger sensor, physically, not pixel-wise. The X100 is Leica size (roughly), and has far less noise (again, an effect of the physically bigger chip), but the users that has written about using it says it is a love hate relationship – in strong light the famed viewfinder just doesn’t work very well, and the menus are sometimes difficult to wade through (typical Fuji, I’d say 😉 ). As the current PEN series was an attempt to create a digital PEN, the Q is an attempt to create a digital equivalent to the Pentax 110, the only camera of its kind – a 110-size SLR! Ditching the pentaprism and mirrorbox makes the Q less unique, but cheaper. Under right circumstances I think both cameras will be able to take outstanding photos, but both are severely handicapped, in their present form (rumours about a DSLR version of the X100 is circulating …).